A teenage extremist who plotted to fight for ISIS and said 'all gay people should be killed' has been jailed for more than three years. Syed Choudhury, a student in Cardiff whose family are from Bradford, trawled the internet for terrorist material and told friends he 'would do anything' to get to Syria. The 19-year-old started researching flights to get to the ISIS-controlled region in February last year. 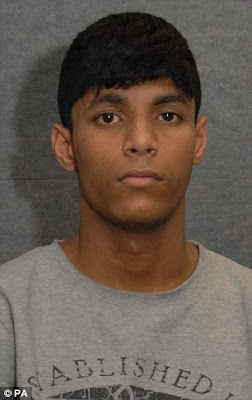 Choudhury downloaded a video of a mass execution and had accessed websites called '10 reasons to join ISIS' and 'Turkey travel, Jihadist Highway', the Old Bailey heard. The teenager was arrested on November 16 last year after being spotted by a local anti-terror officer. When in custody, he spoke about bringing Sharia Law to the UK and said he dreamed of dying fighting for ISIS.